I never thought I would get excited that my website is being upgraded, though I must confess I am actually finding it’s all very exciting! My dear husband has been working hard (in his spare time) upgrading my website over the last few months. There are several new upgrades in the works (shhhhhh top secret) but he has just finished upgrading and simplifying my checkout pages with the new OneStepCheckout. It is a really neat extension that removes the default 6 step checkout into one simple and easy to use page. I am also looking forward to the release of all the other upgrades, that will hopefully be launched over the next few weeks. This is one happy Lizard, who is always keen to make people’s lives easier, especially my lovely customers. 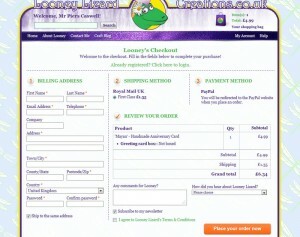 I would love to hear your thoughts, please let me know what you think of the new checkout. This entry was posted in Looney News and tagged website upgrades, new, news, checkout on March 2, 2012 by Sherrie.